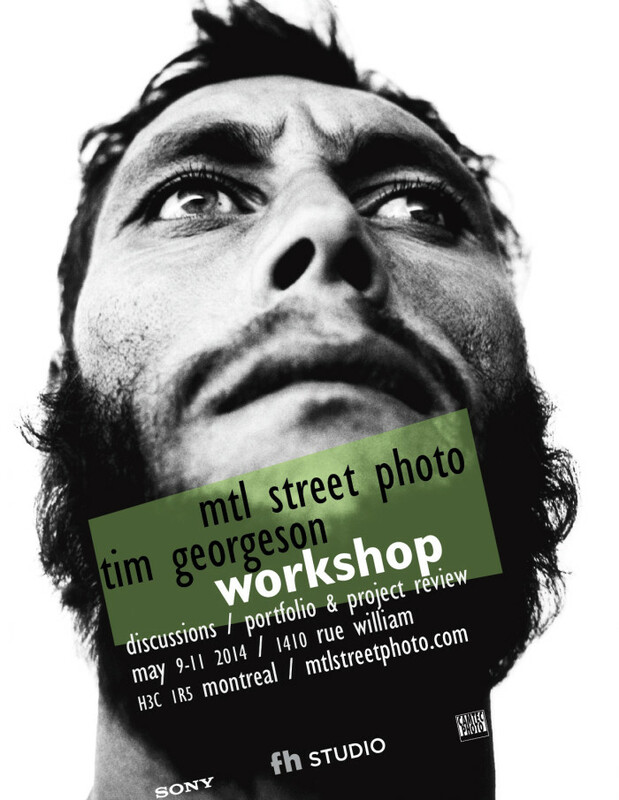 MTL Group Street Photo & Fh Studio is pleased to announce its first photographic Workshop! Open to ten lucky participants, the workshop will be held from May 9 to 11 at FH Studio, 1410 William Street. We are very proud to have as a guest presenter Tim Georgeson , which will bring us knowledge, advice and vision. In addition, the company Sony will sponsor the event and a technical representative will be present on Saturday with 10 cameras and lenses to see and try. Meets Friday 9th from 18h . This will allow us to know, and details of the workshop. Cocktail reception offered by MTL Street Photo. Meeting the morning Saturday at 10am in the studio and then exposed to Tim on his photographic journey. Pierre Villeneuve, the Sony representative, will be present to show their equipment and answer your questions. Journals portfolio group. Each participant will have 30-45min about to present his work. Pause to 13h, dinner offered. Recovery journals to 1:30 p.m. for the afternoon. They will be punctuated by examples from the portfolio of Tim. In the evening we go to dinner Brewers Montreal, near the studio (if you can not come, let us know when you register). Back on Sunday morning at 9am , a light brunch will be offered. Following journals and conclusions. Scheduled end around 13:30. Each participant must bring a project or a portfolio of projects, digital or on paper, and present at the workshop. Afterwards, the work will be studied and critical and Tim we have a discussion. The portfolio should be focused around the documentary-style photography (street, journalism, etc..).We are open to all themes. The photos do not have to have been taken to Montreal. The registration fee is $ 275 and must be paid by Paypal, a check on behalf of Charles Boileau (our Treasurer) or cash. Checks or cash will be given to Emmanuel Thomas who work or Camtec Photo at 26 rue Notre-Dame Est. The deadline for registration and payment is May 1 . To register or if you have questions about the conduct of the workshop, do not hesitate to contact . Hurry, seats will quickly disappear!